Hilliards State School in suburban Brisbane is a long way from the Japanese city of Takasaki. But soon those two places will have a common link – Tara Speakman. Speakman will be joining her Aussie Spirit teammates late this month for one of softball’s biggest international events, the Japan Cup, which will be held in Takasaki, northwest of Tokyo. 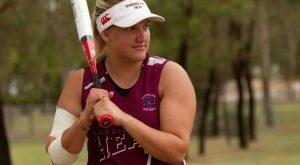 That will be the highlight of a softball career that began at primary school for a young girl who initially wanted to play rugby league but was persuaded by her parents to try softball instead. 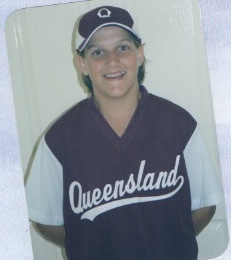 Now 24, Speakman has fond memories of her early softball days, when she played with school friends at Hilliards and later at Moreton Bay College. In those early days at school, she began to develop skills that will soon have her wearing the green and gold. And if all goes according to plan, she will wear that uniform again at the 2020 Tokyo Olympics. Why did you choose softball? What gave you the ‘bug’? I wanted to play football, and my parents thought softball was a better choice. My mum actually played for a long time and thought it may be a game I enjoyed. I liked hitting the ball a long way (as all young kids do). What’s your fondest memory of playing softball at school? I played for Met East when it came to representative school softball, and we had a pretty good team. I think we went through as champions from when I was in grade 8 through to 12. Do you remember your first Hit, Run you scored, or win when you played school softball and how did it feel? I remember my first ever dive for a ball when playing for school sport, I missed it. But still it’s something I had never done before, after that I nearly dove for everything my coach had to tell me to stop. How old were you when it ‘clicked’ that you wanted to be a professional / Elite Softball player? I had always enjoyed the sport and had been playing for fun when I first got selected in the primary school Queensland team. At this time I had earnt so much more about the sport and really enjoyed my time in maroon, I think it was then when I really locked in to the idea that it’s something I wanted to be good at and started striving to improve my game. What are your top three tips to children about playing softball? Be a team player, the friends you make is what you’ll remember the most and keep you going when you go through the hard days. Listen and respect your coaches, they are always trying to help you don’t forget that. What is the most common misconception about softball you would like to clarify? The ball is not soft and we do not hit off a tee. What is your favourite part of the game? All of it, I really enjoy being competitive. I think one of the hardest parts (and something I enjoy) is the battle with a pitcher when you’re hitting. It’s a one on one, you’re there trying to get your job done and so are they. It’s a battle every at bat a constant challenge and it brings out your competitive spirit. When your elite playing career is completed what is your next dream? I would like to coach softball both at a club level and a representative level. It’s very rewarding teaching about something you love, hoping you can turn kids in to passionate athletes and even better humans. From school star to this! A day in the life of a teacher, now a little easier! Softball - an easy choice! The success of the Softball Batter Up program can be attributed to the quality of the excellent resources. Coaches and teachers can access these resources for free when they register to deliver a program.